2 Peter 2:1-3 " But false prophets also arose among the people, just as there will also be false teachers among you, who will secretly introduce destructive heresies, even denying the Master who bought them, bringing swift destruction upon themselves. 2 Many will follow their sensuality, and because of them the way of the truth will be maligned; 3 and in their greed they will exploit you with false words; their judgment from long ago is not idle, and their destruction is not asleep." in the normal tradition and attendance of church, he had a blurred vision of salvation and biblical understanding. At the age of 18, Prophet Pickens began to have encounters, out of body experiences, and dreams of Meeting Jesus at Judgement. At a very young age, Prophet Pickens was a very strange child. He would say things that seemed so long distant and they would come to past the moment he says it. Being in a broken family, he struggled to find his place as a young man and at the age of 18, Prophet Pickens got saved. From a very lonely and traumatic past, he had a thirst for God that was unbelievable. He desired God more than he desired to breathe. After serving many years in ministry God spoke to him and told him to drop all his titles that were given by Man to become a son. Upon this execution, devastation hit his life but obedience began. A few months later God spoke to him and revealed to him that he ordained him as a prophet to the nations. Prophet Rod then came under an apostolic covering under the leadership of Apostle Tina Edwards, where the fear of being obedient was broken. Being trained in the Prophetic and taking School of the Prophets Courses, His journey as a Prophet Began. Prophet Pickens has been blessed with a ministry of Healing and Deliverance with signs, wonders, and miracles. The testimony reports of healings and supernatural interactions have been witnessed and credited to his ministry. Prophet Rod has done revivals, musical performances, and much more. After years of ministry, Prophet Pickens has become a recognized prophetic voice: A preacher of Holiness and a student of the Word. Roderickus Pickens is renowned for his prophetic accuracy, humility, and passion. God has equipped Prophet Pickens to see and speak into the spirit realm to confirm, shift, and change. 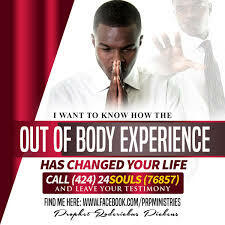 In 2016, around the month of June, Prophet Rod release a video of "The out of body experience" where it went viral and over 2 Million views where confirmed and thousands of souls have been saved and restored". 1. Roderickus Pickens claims to be a "prophet"- Biblically speaking there are no modern day prophets - " In the New Testament, the gift of the office of prophet was a temporary one granted by God for the purpose of building His Church. Contrary to the apostles, who had broad ministries, these men had localized ministries within local churches, as we see illustrated in such places as Acts 11:21-28 and Acts 13:1. They were gifted men given to the Church and appointed by God (Eph. 4:11, 1 Cor. 12:28) for the purpose of helping to lay the foundation of the Church (Eph. 2:20). They, like the apostles, received God’s revelation (Eph. 3:5) and truth and proclaimed it to their churches. It is important to remember that the early Church did not have a completed Bible, so God granted this revelation for the purpose of teaching His message to the Church. The New Testament prophets also spoke forth and taught the apostles’ doctrine. Everything taught by these prophets had to be consistent with the teaching of the apostles (1 Cor. 14:36-37). The foundation of the Church was laid long ago. God’s revealed Word was completed with the close of the New Testament canon. The Church’s foundation does not need to be laid again, and there is no need for further revelation beyond what God has provided for us in His complete Word, the Bible. Today we are blessed to have Scripture as our complete and final authority in all things (2 Tim. 3:16-17). If someone now claims to have received a “special revelation,” we must test it against Scripture. If it is contrary to the Word of God, then it must be rejected. If it is consistent with Scripture, then we have to ask why an “extra” word was necessary if its truth is already contained in the Bible. So while we always need men who are willing to proclaim boldly the Word of God as contained in Scripture (as pastors, teachers, and evangelists), there is no need for the office of “prophet” as it existed in the New Testament"(https://carm.org/question-modern-prophets). 2. Roderickus Pickens does not have an official statement of faith on his website- The church is the pillar of truth- 1 Timothy 3:15 and the church is called to proclaim the gospel- Matthew 28:19-20. It is of no surprise that false prophet Rod Pickens has no official statement of faith on the gospel with scripture in context and other essential Christian doctrines so that discerning Christians may test to know if he is of God in light of scripture like 1 John 4:1(which he is not). Essential christian doctrines are true that true Christians cannot deny . For more on essential doctrines, read this - https://carm.org/essential-christian-doctrines . False prophet Rod has no official statement of beliefs yet he has a page asking for financial donations to his false ministry. 3. Roderickus Pickens promotes the false teaching of modern day apostles - From his heretical biography, he states "Prophet Rod then came under an apostolic covering under the leadership of Apostle Tina Edwards, where the fear of being obedient was broken. Being trained in the Prophetic and taking School of the Prophets Courses, His journey as a Prophet Began". Tina Edwards is false teacher and apostle. "Biblically, an apostle was someone who was involved with Jesus and/or knew of Jesus before his crucifixion and after his crucifixion. Consider the following two sets of verses. "In recent years, Christian booksellers have inundated the evangelical world with testimonies from people who say they visited heaven in near-death experiences. Their stories are full of specific details about what heaven is like, who is there, and what is happening in the celestial realm. But when we compare their claims with Scripture, it becomes clear that they are merely figments of the human imagination, not true visions of heaven as it is described in God’s Word. The best known of all these tales, Heaven Is for Real,1 was a major motion picture, released in April 2014. It is the story of Colton Burpo, whose parents believe he visited heaven when he was just four—during surgery after a burst appendix nearly took his life. Colton’s descriptions of heaven are full of fanciful features and peculiar details that bear all the earmarks of a child’s vivid imagination. There’s nothing transcendent or even particularly enlightening about Colton’s heaven. It is completely devoid of the breathtaking glory featured in every biblical description of the heavenly realm. Stories like Colton’s are as dangerous as they are seductive. Readers not only get a twisted, unbiblical picture of heaven; they also imbibe a subjective, superstitious, shallow brand of spirituality. Studying mystical accounts of supposed journeys into the afterlife yields nothing but confusion, contradiction, false hope, bad doctrine, and a host of similar evils. We live in a narcissistic culture, and it shows in these accounts of people who claim they’ve been to heaven. They sound as if they viewed paradise in a mirror, keeping themselves in the foreground. They say comparatively little about God or His glory. But the glory of God is what the Bible says fills, illuminates, and defines heaven. Instead, the authors of these stories seem obsessed with details like how good they felt—how peaceful, how happy, how comforted they were; how they received privileges and accolades; how fun and enlightening their experience was; and how many things they think they now understand perfectly that could never be gleaned from Scripture alone. In short, they glorify self while barely noticing God’s glory. They highlight everything but what’s truly important about heaven. It is quite true that heaven is a place of perfect bliss—devoid of all sorrow and sin, full of exultation and enjoyment—a place where grace and peace reign totally unchallenged. Heaven is where every true treasure and every eternal reward is laid up for the redeemed. Anyone whose destiny is heaven will certainly experience more joy and honor there than the fallen mind is capable of comprehending—infinitely more than any fallen creature deserves. But if you actually saw heaven and lived to tell about it, those things are not what would capture your heart and imagination. You would be preoccupied instead with the majesty and grace of the One whose glory fills the place. Sadly, undiscerning readers abound, and they take these postmodern accounts of heaven altogether seriously. The stratospheric sales figures and far-reaching influence of these books ought to be a matter of serious concern for anyone who truly loves the Word of God. Four biblical authors had visions of heaven—not near-death experiences. Isaiah and Ezekiel (Old Testament prophets) and Paul and John (New Testament apostles) all had such visions. Two other biblical figures—Micaiah and Stephen—got glimpses of heaven, but what they saw is merely mentioned, not described ( 2 Chronicles 18:18; Acts 7:55 ). Only three of these men later wrote about what they saw—and the details they gave were comparatively sparse ( Isaiah 6:1–4 ; Ezekiel 1, 10 ; Revelation 4–6 ). All of them focused properly on God’s glory. They also mentioned their own fear and shame in the presence of such glory. They had nothing to say about the mundane features that are so prominent in modern tales about heaven (things like picnics, games, juvenile attractions, familiar faces, odd conversations, and so on). Paul gave no actual description of heaven but simply said what he saw would be unlawful to utter. In short, the biblical descriptions of heaven could hardly be any more different from today’s fanciful stories about heaven. Lazarus of Bethany fell ill and died, and his body lay decaying in a tomb for four days until Jesus raised him ( John 11:17 ). A whole chapter in John’s Gospel is devoted to the story of how Jesus brought him back from the dead. But there’s not a hint or a whisper anywhere in Scripture about what happened to Lazarus’s soul in that four-day interim. The same thing is true of every person in Scripture who was ever brought back from the dead, beginning with the widow’s son whom Elijah raised in 1 Kings 17:17–24 and culminating with Eutychus, who was healed by Paul in Acts 20:9–12 . Not one biblical person ever gave any recorded account of his or her postmortem experience in the realm of departed souls. Far too much of the present interest in heaven, angels, and the afterlife stems from carnal curiosity. It is not a trend biblical Christians should encourage or celebrate. Any pursuit that diminishes people’s reliance on the Bible is fraught with grave spiritual dangers—especially if it is something that leads gullible souls into superstition, gnosticism, occultism, New Age philosophies, or any kind of spiritual confusion. Those are undeniably the roads most traveled by people who feed a morbid craving for detailed information about the afterlife, devouring stories of people who claim to have gone to the realm of the dead and returned. Scripture never indulges that desire. In the Old Testament era, every attempt to communicate with the dead was deemed a sin on par with sacrificing infants to false gods ( Deuteronomy 18:10–12 ). The Hebrew Scriptures say comparatively little about the disposition of souls after death, and the people of God were strictly forbidden to inquire further on their own. Necromancy was a major feature of Egyptian religion. It also dominated every religion known among the Canaanites. But under Moses’s law it was a sin punishable by death ( Leviticus 20:27 ). The New Testament adds much to our understanding of heaven (and hell), but we are still not permitted to add our own subjective ideas and experience-based conclusions to what God has specifically revealed through His inerrant Word. Indeed, we are forbidden in all spiritual matters to go beyond what is written ( 1 Corinthians 4:6 ). What God has revealed in Scripture is the only legitimate place to get a clear understanding of the heavenly kingdom. God’s written Word does in fact give us a remarkably full and clear picture of heaven and the spiritual realm. But the Bible still leaves many questions unanswered. We need to accept the boundaries God Himself has put on what He has revealed. It is sheer folly to speculate where Scripture is silent. It is sinfully wrong to try to investigate spiritual mysteries using occult means. And it is seriously dangerous to listen to anyone who claims to know more about God, heaven, angels, or the afterlife than God Himself has revealed to us in Scripture. It is, however, right and beneficial for Christians to fix their hearts on heaven. Scripture commands us to cultivate that perspective: “ If then you were raised with Christ, seek those things which are above, where Christ is, sitting at the right hand of God. Set your mind on things above, not on things on earth ” ( Colossians 3:1–2 ). “ While we do not look at the things which are seen but at the things which are not seen. For the things which are seen are temporary, but the things which are not seen are eternal ” ( 2 Corinthians 4:18 ). “ For our citizenship is in heaven, from which we also eagerly wait for the Savior, the Lord Jesus Christ ” ( Philippians 3:20 ). Such a perspective is the very essence of true faith, according to Hebrews 11. Those with authentic, biblical faith acknowledge that they are strangers and pilgrims on this earth ( v. 13 ). They are seeking a heavenly homeland ( v. 14 ). They “desire a better, that is, a heavenly country. Therefore God is not ashamed to be called their God, for he has prepared a city for them” ( v. 16 ). The “city” that verse refers to is the heavenly Jerusalem, an unimaginable place—the very capital of heaven. It will be the eternal abode of the redeemed. No wonder Christians are intrigued with the subject.